5-year-old Haleigh Cummings was snatched from her own bed just after 3am, February 9th, in a mobile home in northeast Florida. The girl’s parents are divorced. She was being watched by her father’s 17-year-old girlfriend when she disappeared. 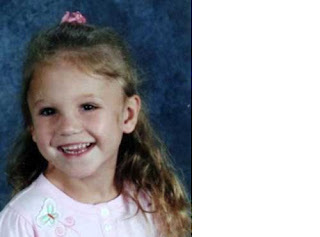 The Putnam County Sheriff’s Office said investigators think Haleigh was abducted because house-to-house searches of the neighborhood Wednesday found no evidence that she wandered away. Haleigh’s father, Ronald Cummings also said he didn’t believe she had left their home in the middle of the night. “I know somebody took her. I know for a fact she didn’t wander off. She’s afraid of the dark,” Ronald Cummings told several reporters. It’s been 9 days since Haleigh vanished. The ground search has subsided and police are focused more on the investigation at this point. Some of her family members were given lie detector tests but the sheriff’s office won’t discuss the results. Almost 1,200 tips have poured into a Crimestoppers hot line. One of those tips claim that Haleigh’s father’s girlfriend, 17-year-old Misty Croslin, may not have been at home the night Haleigh disappeared. Authorities ask anyone with any information to call Crimes Stoppers at 888-277-TIPS or the FDLE’s Missing Endangered Persons Information Clearinghouse at 888-FL-MISSING. If you pray, please keep Haleigh Cummings and her family in your prayers.